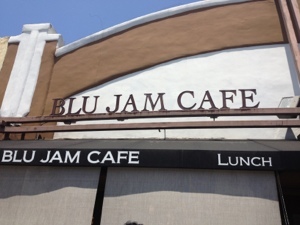 Don’t go to Blu Jam Cafe in Los Angeles, California on Melrose on a Sunday when you are hungry, but if you opt to be a die hard and wait over an hour for a table, to slightly curb your hunger pains grab a fruit juice from across the street, and be prepared to add multiple quarters to your metered parking, but after the wait is over, the joy will absolutely begin. 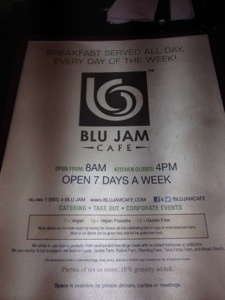 Now if you took my advice and ordered the juice only from across the street, then it will be perfectly fine to order the egg brioche dipped in batter french toast with crunchy corn flakes, topped with strawberries, blueberries, & bananas, with a side of vanilla bean sauce. The concept of french toast rolled in corn flakes seems like a quirky concept, but the realties of this dish is absolutely delectable. What could be more wonderful than bread that is crispy on the outside and smooth and slightly creamy on the inside, with a taste of added sweetness. 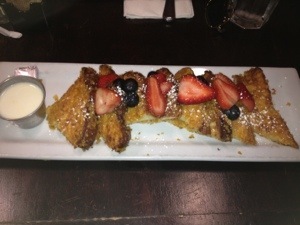 I promise you the taste of this french toast is as sweet and savory as Lebron James winning game #2, against San Antonio. 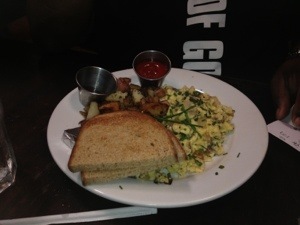 Now if vegetarian is the preferable option for all of you non-carnivores the “Old World” dish is just what the vegan community ordered which is scrambles eggs with sautéed onions, fresh mushrooms, chives, mozzarella, served with potatoes & toast, the fluffy eggs and potatoes taste like my daddy made them. Whenever you go out to eat with a group there is always one person that orders a semi-healthy meal in an effort to make all the other people at the table feel guilty. 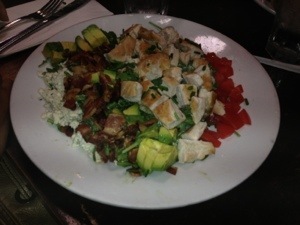 This is what I call a non-verbal jab that somehow makes everyone feel bad, but never bad enough to reverse their order, and that person always orders a salad, and my jabber ordered a Cobb Salad and usually there is never anything remarkable about a salad, but this salad with grilled chicken was flavor on steroids, all the flavors mixed together absolutely beautifully, and the smokiness of the bacon, was exactly what the pig lover ordered. I waited an insane amount of the time for this meal, but I can write it was absolutely worth it, this meal is sure to bring you the same level of euphoria as finding out that Monday and Tuesdays are holidays from work from now until retirement.